Richardson fitted professional black umpire cap with embroidered AU logo. The Pulse FlexFit umpire hat is unique in fit and the ability to keep you cool. Available in all three visor sizes: Plate, Combo and Base. 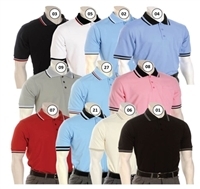 This mid-weight shirt wears well, has a soft feel and keeps you cool. Embroidered with the AU Logo. EMBROIDERED ITEMS ARE NOT AVAILABLE FOR IMMEDIATE DELIVERY. 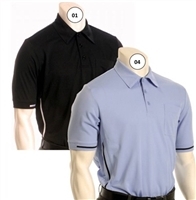 This lighter-weight, pebble-knit professional style shirt lets you look like the MLB umpires at a little lower price withthe American Umpires Logo. Smitty's MLB Style 2016 Shirt with American Umpires logo. Smitty's convertible pullover allows you to remove the sleeves in response to flexible weather conditions. Available in two color combinations. Smitty's convertible pullover allows you to remove the sleeves in response to flexible weather conditions. 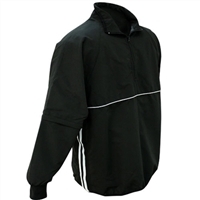 This Major League style umpire jacket is designed to keep you warm during cold weather games without adding bulk and weight.